This game is due for release on the Nintendo 3DS. This game is a retail & download title and is a spin-off of both Pokémon and Art Academy. This game teaches the player how to draw using 40 different tutorials of increasing levels of difficulty. After that, you are able to draw Pokémon fully and share your images. 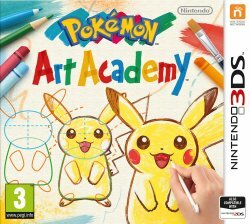 In the game, you play as a character entering the Pokémon Art Academy to become an artist on Pokémon cards. Under the tutelage of Andy, the head of the Art Academy, you are taken through 40 different lessons of various difficulty that teach you about the various dfifferent artistic styles and techniques from shading to hatching and much more. In addition to the 40 lessons, there are over 110 different templates from which you can create your own images. In addition to that, you can even base images off of photographs you have taken as well as other images that have been saved to your SD Card. This game is the first Nintendo 3DS game to have built in Miiverse functionality, allowing you to upload your images in a decent 640x480 size. In addition to that, you can save them on an SD card and share them at the increased resolution of 1024x768. You can also share images you draw with other players locally, using the 3DS's local wireless feature. They can be shared either as an album image or as a standard JPG image.